California just experienced its hottest July on record as the U.S. experienced its hottest May through July. 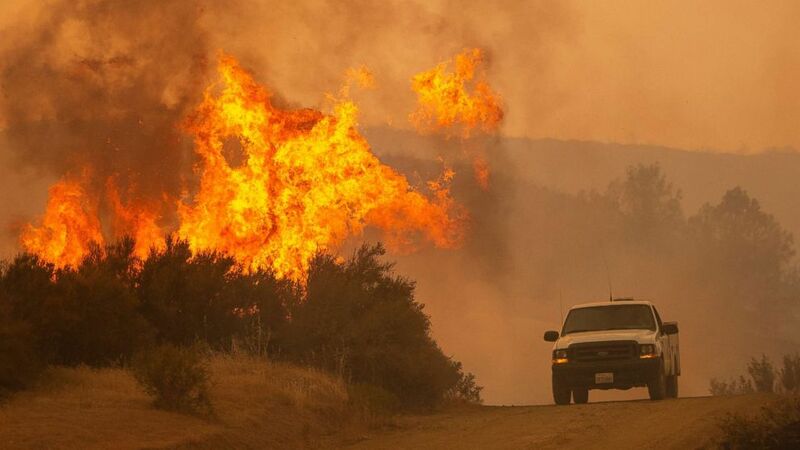 At least 60 uncontained fires continue to burn, mostly out West. More record highs are possible today, with advisories issued from California to Montana. Gusty winds and dry conditions could add another degree of difficulty to fighting wildfires that continue to ravage much of the region. Slightly cooler temperatures are expected over the next few days on the West Coast. More than 150 damaging storms were reported in the East, with many of those coming from in or near the Carolinas. Fallen trees bashed homes, and more than two dozen people were rescued after strong winds capsized their boats in North Carolina on Wednesday. A cold front is expected to move through the Northeast today, at least temporarily ending the heat wave for major cities including Boston and Washington, D.C. But more rain also is expected -- as much as 4 inches in some parts. Parts of the South, including western Texas, also could see heavy precipitation. Hurricane Hector, a Category 3 with winds of 115 mph, should be passing safely by Hawaii, where the biggest concern remains large surf. The two other systems in the Pacific also aren't headed for land.